Each person has 2 kidneys situated in the lower back. Each kidney is made up of ~ 1 million tiny filtering units called the “glomeruli”. The glomeruli filter or cleanse our blood continuously to produce urine to remove waste products, salts and excess water from our body. Diseases that affect the glomeruli are called glomerulopathy or glomerulonephritis. When glomeruli become damaged, protein and blood may leak into the urine resulting in proteinuria or haematuria. This may also result in body swelling, high blood pressure and even kidney failure. FSGS is a disease that causes urinary loss of protein and eventual scarring (sclerosis) of the glomeruli. Focal is used because only some of the glomeruli or filters are affected and segmental means only part of a single glomerulus or filter is scarred. 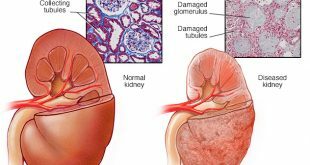 Focal segmental glomerulosclerosis is a common glomerulopathy affecting people of all ages, especially those < 45 years old. From the 2nd Report of the Malaysian Registry of Renal Biopsy, FSGS accounts for 30% of all primary glomerulonephritis. The mean age at biopsy was 32.5 ± 13.5 years. FSGS may be “primary” which means the disease happens on its own, without any obvious causes; or “secondary”, where the FSGS is caused or associated with another medical condition. Oedema or Nephrotic syndrome – body swelling especially around the eyes, feet and hands. This is due to the leakage of a large amount of protein in the urine. From the 2nd Report of the Malaysian Registry of Renal Biopsy, the majority (65%) of patients with FSGS presented with nephrotic syndrome. 21% presented with asymptomatic urinary abnormalities. High blood pressure was found in 18% of cases and 41% presented with impaired kidney function (eGFR< 60mls/min). Blood tests: to determine the levels of protein, albumin, cholesterol in the blood, to determine the level of kidney functions and to look for possible secondary causes. Kidney biopsy: to get a small piece of kidney tissue for examination under the microscope. This test is needed to confirm the diagnosis of FSGS, distinguish the different types of FSGS, guide treatment and provide information about prognosis. Patients are also advised to stop smoking, take low salt diet and have a healthy lifestyle. 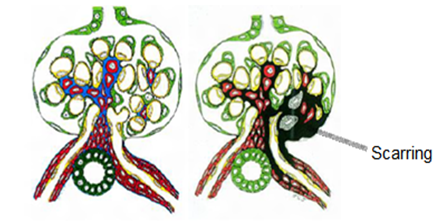 The natural history of FSGS varies a great deal. Treatment may cure the disease or slow down the disease progression in some patients. Some patients who responded to treatment initially may relapse (disease may come back again). Some patients may eventually develop kidney failure although the time varies widely from 2-20 years. The severity of proteinuria, kidney biopsy changes, and response to treatment may help to predict the outcome. Patients with FSGS who progress to end-stage kidney failure may be transplanted although the FSGS may return in the transplanted kidney in 20-50% of cases.